Well, here is picture of my belly, which many of you have been bugging me about posting. 26 weeks pregnant and already as round as can be! I am so excited for this new baby to get here. Dr Gourley has already agreed to induce me on February 8th, which I could not love him enough for!!! This pregnancy has by far the worst one, but I have been most excited and anxious to meet this little boy. By the way, his name is Truman David (named after one of my heros, my Grandpa Hatch) and we will be calling him True. We have been very busy with school (Matt and Ethan), cupcakes, holidays and just life. Ethan is loving his first year of kindergarten. He is doing extremely well and is already reading books to us. Finn, is repeating everything we say and is more hilarious then ever! He keeps us laughing all the time. Baby True is growing leaps and bounds and is kicking all over the place. My belly is as round as can be. Can't wait to meet this babe and love and kiss him. Matt is still in school full time and just started a new job as a graphic design assistant at UVU. He LOVES it! As for me, I am just a pregnant cupcake baker. Baking cupcakes and taking care of the family is basically my life right now. Ethan lost his first baby tooth! The tooth fairy came and all he had to say was, "Did she drive here in her car?" What a boy! The pumpkin patch in Carmel Valley, CA. It was fun to go to the pumpkin patch this year with Grandma Judy. She bought the boys the cutest little pumpkins you have ever seen. Ethan being his silly self as usual. Where did this kid come from? Just some cute photos of my boys waiting for Brett and Kristi's wedding ceremony to start. Fall is my very favorite time of year. I don't know if it's the holidays, the weather or what. I got my Halloween decorations out early this year, because I just couldn't wait. Ethan was a robot this year. Isn't he so cute! Matt, being the artist that he is, made Ethan's costume. He took this very seriously! 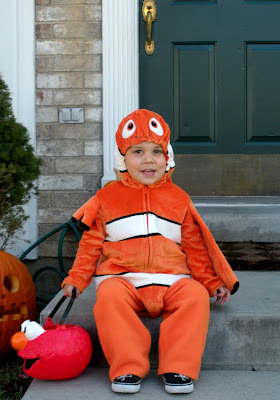 He talked about wearing this costume and had it on several times all month. It was just a hand-me-down from Ethan. I had no idea he would love it so much!